If you’re looking to hire a new employee in your organization, an employee application form is essential. To make it easy for you and to simplify the application process, we have a wide range of ready to use Application Forms. These forms are available in a range of formats, can be easily edited, absolutely free of cost and are also printer-friendly. They are professionally drafted and can be used by organizations of small, medium as well as large sizes. The sample Employment Application Forms has space for the user to fill in complete details about his educational background, personal information, experience and other information. 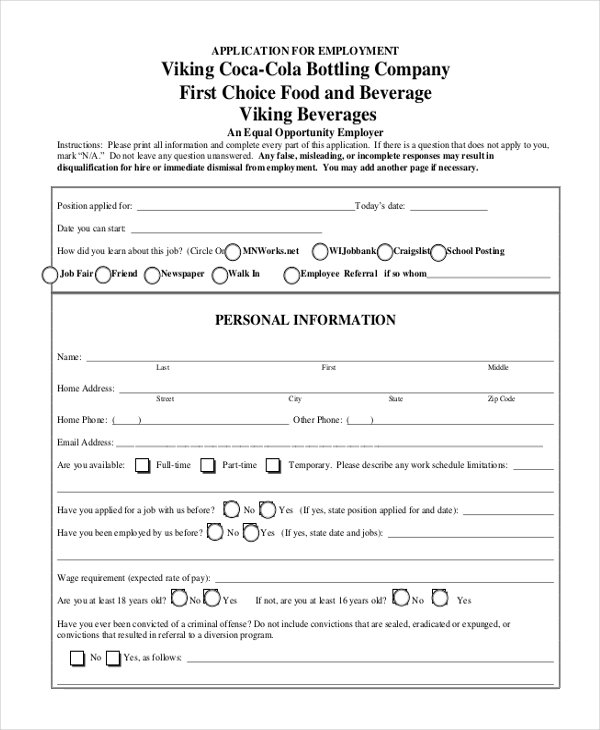 Companies can use this sample form to hand over to prospective employees to fill in. The employment application form is handed over by the organization to a prospective employee to fill in details about his background and experience. This form is available in PDF format. The general employment application form can be used by all kinds of companies. This form is not industry specific. 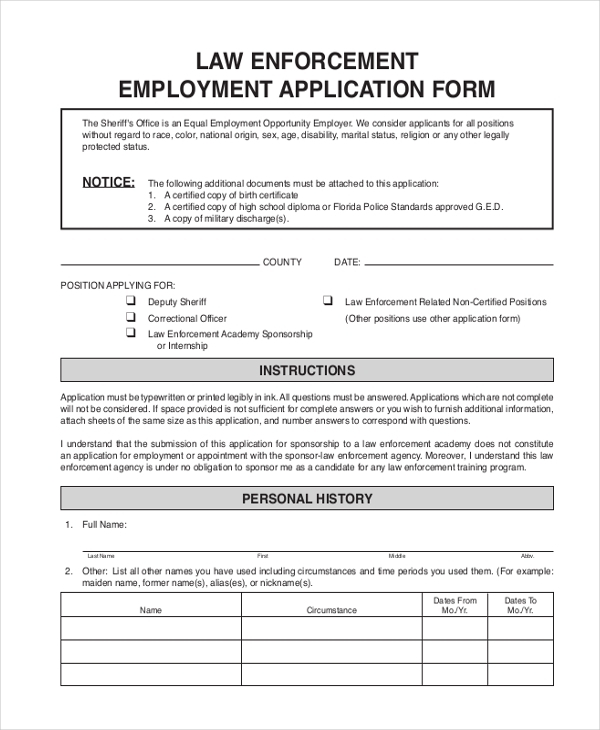 The general employment application form is available in Word format and is easily editable. 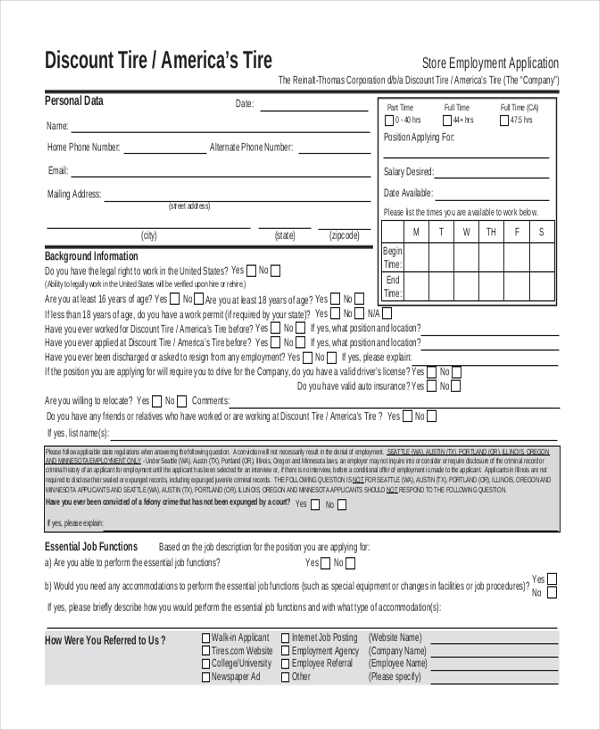 The target employment application form is available in PDF format. This form is drafted in a way to best suit companies in the foods and beverages industries. 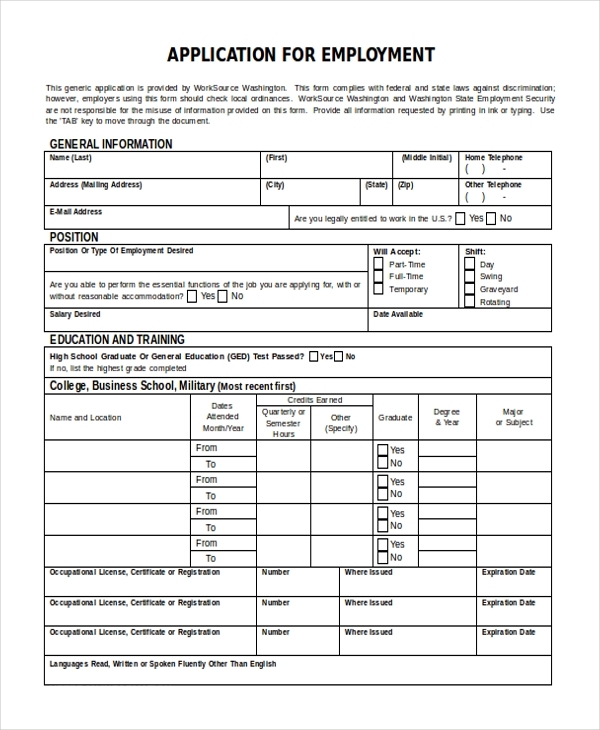 There is space on this form for the user to fill in personal information, experience, and educational background. 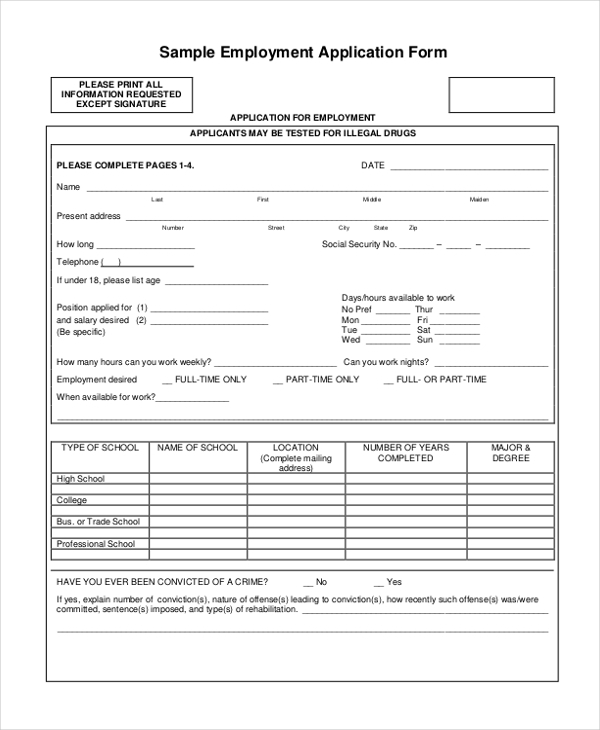 The generic employment application form is available in Word format and can be easily edited. This form is best suited for government offices. The user can fill in personal details, details about his educational background as well as voluntary services he may have engaged in. The standard employment application form can be used by all industries. This form is available in PDF format. The user can add all his personal details, criminal history, and previous employer information to this form. 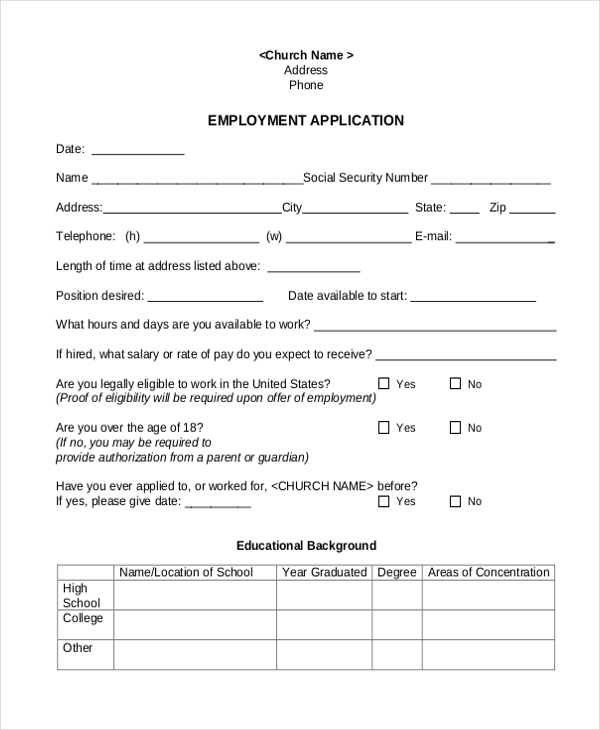 The church employment application form is ideal for churches and other religious institutions. The form is available in PDF format. The user can add details of the position he wishes to apply for, his personal information, church activities, educational background and other details. 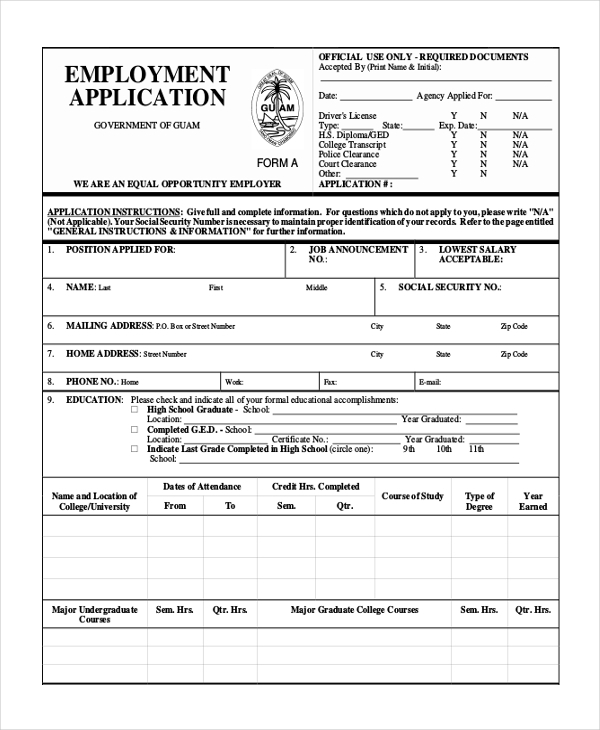 The store application employment form is best suited for chain stores and retail shops. The form is available in PDF format. It is a highly detailed form. There is space for the user to fill in his personal information, previous employment information, and other details. The government employment application form is available in PDF format. 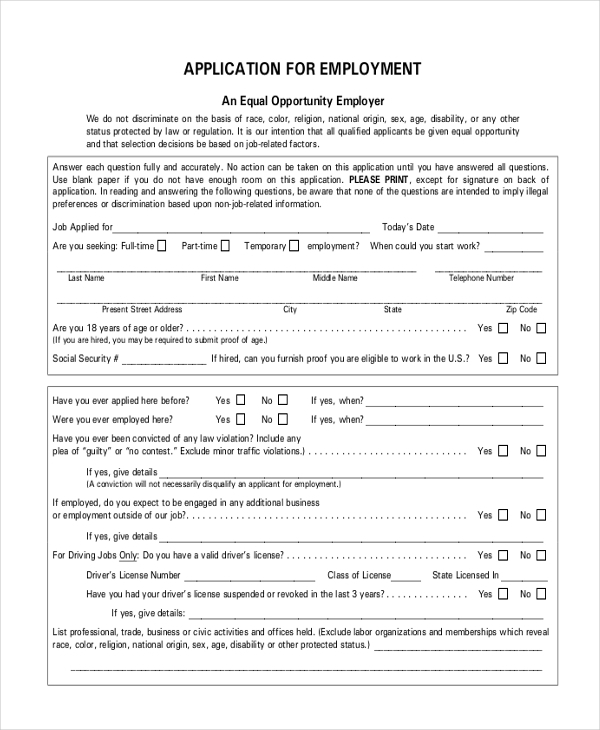 This form is best suited for government offices and positions. The form is a heavily detailed one and demands of a lot of information of the user. 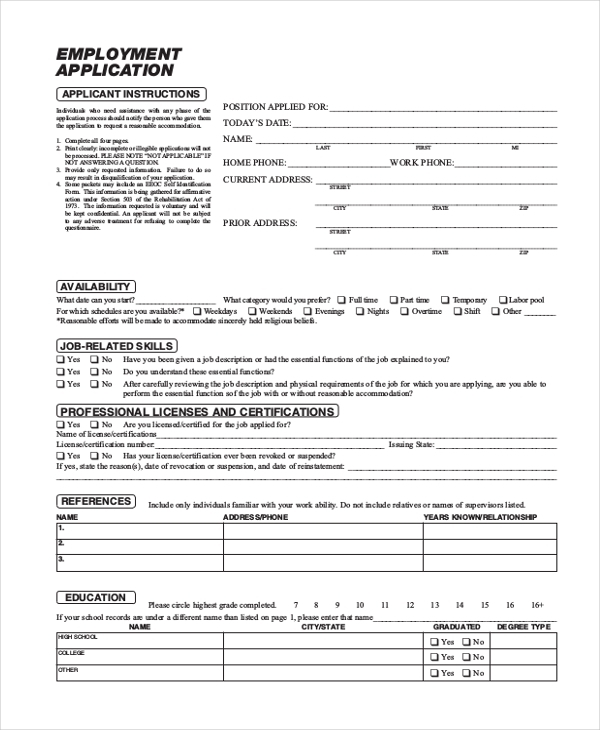 The law enforcement employment application form is best suited for law enforcement units. The form is available in PDF format. The user has space to add in his personal information, previous employment information and lots of other details. 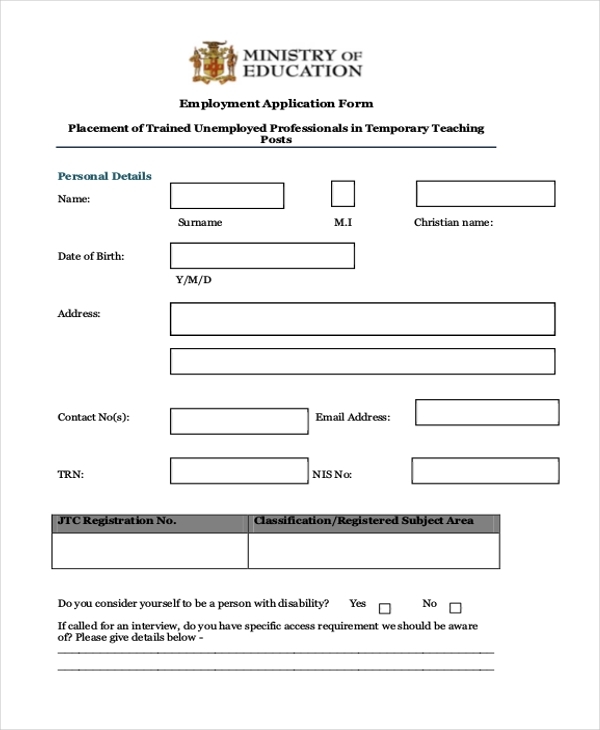 The teacher employment application form can be used by schools, universities, colleges and other types of educational institutions. This form is available in PDF format. It is a simple form where the applicant can fill in all his necessary details. What are the Benefits of the Employment Application Forms? The employment application forms have several benefits. First and foremost they are absolutely free of cost and can be easily downloaded. One need not waste hours on end drawing up an application form from scratch. Secondly, being easily editable, the company can add columns and questions as per their requirements to extract necessary information from the applicant without any wasting of time. Lastly, the employment application forms are also beneficial because of their convenient and universal formats, enabling companies from across the globe and of all sizes to use them freely. Thus, the employment form applications are extremely beneficial to users. 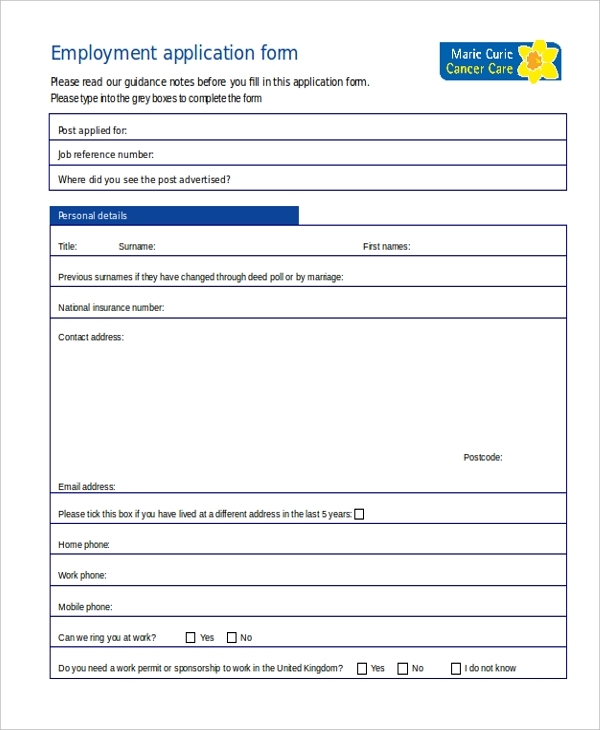 You may also see Employee Application Forms. What is the Main Target Audience of the Employment Application Forms? The employment application forms prove to be handy to all types of employers and companies that are looking to hire staff. From companies in the foods and beverages industries to government offices, educational institutions, law enforcement agencies, chain stores, retail stores, banks and various other institutions and organizations can use these professionally drafted employment forms. Even people looking to make an application for a post in a specific organization can use the employment application forms to make their application look simple yet detailed and neat. Thus the employment application forms can be used by both people looking to hire as well as people looking to apply for a job. Why are Employment Application Forms Essential? Different companies require different information of prospective employees. If an employee is to draw up his own employment application, he may miss out on sharing certain vital and necessary information about himself to the organization or company. In order to prevent the back and forth in correspondence, it is easier for the company to have a ready to use the application form that it can hand over to a prospective employee to fill in and thereby instantly extract all the information about him that they require. Also, the employee application forms are essential because the HR manager can keep these forms filed for future use or reference. You can also see Sponsorship Application Forms. With the help of these well-drafted and detailed employment application forms, you no longer need to worry about missing out on any vital employee information. Just select one of the forms from our wide and professionally drafted range, edit it, print it out and hand it over to your next applicant.